When I was newly married and commuting from Connecticut to New York City each week day, I would pass the time riding Metro North by reading Bon Appetit and Gourmet magazines. I would pour over the recipes, envisioning the cooking process and the finished product. I would nearly drool on the scrumptious photographs. And I vowed that I would make at least one recipe each month. Two years later, when we moved into the city and the plethora of specialty food shops was but a subway ride away, I began to expand my culinary interests. Martha Stewart was my hero. I loved preparing and eating gourmet food. My…how times have changed! While I still appreciate a fine gourmet meal every once in a while, I am really more of a family style, comfort food junkie. Perhaps it was the move from cosmopolitan NYC to barbecue capital Kansas City. Maybe it was the change in family dynamic from DINK (dual income – no kids) to SAHM (stay at home mom of three kids): disposable income was drastically reduced and picky eaters take the joy out of cooking. But whatever the reason, I now find that my culinary hero is no longer Martha, but rather Guy. If I were born in another place and time, I would love to have Guy Fieri’s job on Diners, Drive-ins, and Dives. I could travel across this great country of ours, visiting folks who are the salt of the earth, and eating some of the best stick-your-ribs food in the world. While that dream is no longer viable, I can do the next best thing. It is my dream to travel to all 50 states, using Guy’s cookbooks as a road map (and imagine my total excitement when I discovered this link that has marked all the restaurants on this google map!). I envision living the life of Margot and her husband — putting furniture in storage, packing up the RV, and hitting the high road. We would venture South in the winter – North in the summer – East in the fall – and remain in the Midwest during the spring. Hopefully I would have honed the photography and writing skills that I am focused on now so that I could document the trip with pictures and narratives. I might even dedicate a new blog to the event: Guy is my Co-Pilot, to use as a resource to store (and share) my restaurant reviews. Of course, eating all this heavy fare would necessitate a bit of exercise be added to the routine – so my plan is to visit the museums across the country as well. Walking through the exhibits would not only help the heart, but also the mind. Yes, that is my long-term dream. But fortunately I do not have to wait until we retire to begin this adventure. There are a number of Dives within a few hours drive of Kansas City, and Geoff and I have visited a couple this summer. 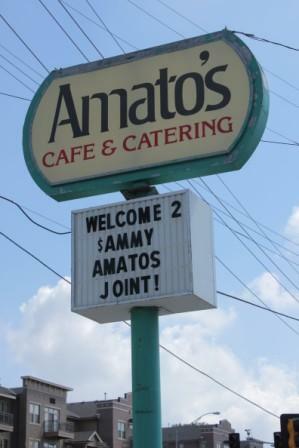 Most recently we ate at Amato’s in Omaha, Nebraska. I saw the repeat episode (it was first aired about two years ago) in mid-July and immediately knew this would be a place that Geoff would enjoy. Sam Amato is the owner and he has prepared the homemade Italian sausage, marinara sauce, and ricotta cheese for decades (homemade ricotta? I had never heard of such a thing). Geoff managed to eat there on a business trip one day and said the food did not disappoint. He ordered a Sausage grinder and said he could close his eyes, breath in the spicy aroma, and be transported back to his grandmother’s house in Bridgeport, Connecticut. Let me tell you – that is about the highest praise that any Italian restaurant can achieve in our household. In talking with the Sam (he apparently spends the entire time visiting the tables and chatting with the customers – which is an authentic Italian trait) Geoff learned that the restaurant will be closing soon. Apparently the University of Nebraska is purchasing the space, and none of Sam’s kids have a desire to re-open elsewhere in the city. This news is what necessitated our impromptu visit to Omaha last weekend. 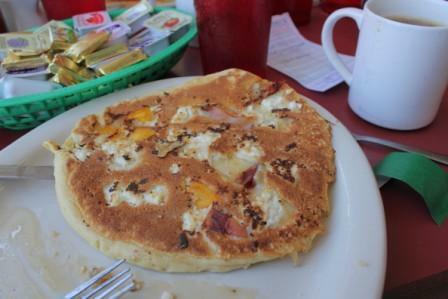 Amato’s is only open for breakfast and lunch and the menu is somewhat limited to eggs, pancakes, and sandwiches. The special of the day was homemade ricotta pancakes with peaches. I firmly believe in the adage, “When in Rome…..” and so I ordered the special. The short stack included two pancakes (one too many, in my humble opinion) and grilled to golden perfection. The ricotta gave the cake a creamy consistency, but the flavor was quite mild. The peaches were roughly chopped and generously distributed to allow for a few choice chunks with every bite. A drizzle of maple syrup was all that was needed to bring this dish to perfection. I am afraid that this pancake experience has ruined me for anything I might order at IHOP again. Not everyone at the table ordered the pancakes. My youngest ordered an omelet filled with salami, capacollo, and prosciutto — which was stuffed with meat and cheese and the egg was as thin as a crepe. My son-in-law ordered biscuits and gravy Italian style, which was heavy on the sausage and, I was told, as delicious as it sounds. We finished the meal around 11:30AM, visited the Omaha zoo for about four or five hours, and I did not feel the need to eat again until 8:00PM that evening. It definitely stuck to our ribs – and our taste buds – and increased our desire to live near a authentic Italian grocer. It's funny how we change through the years. I used to spend a lot more time on food preparation than I do now and I'm not really sure why. I think I've just gotten tired of it. If you do take up your dream, let me tell you that you're off to great start. Great post and photographs. I sill love to cook and Mr. BFR still loves to eat, so that hasn't changed. But what have changed are the ingredients and the amount of fats I use. And I rarely have dinner parties anymore — I used to love to do that, but now I don't feel like spiffing up the house. Your husband's remark reminds me of a comment my then 10 year old nephew made while judging a meatball competition. Something like "if they taste like my Grandma's, then I give them a thumbs up!" He was quoted in the local newspaper. My mom loved it! Both your idea of traveling around the US and your meal at the restaurant sound fantastic! Now, I will most likely never get to Omaha, but I am still sad they are closing. I am envious of your experience in Omaha. We've been trying to visit the places Guy visits too. So far we've only found one that didn't live up to Guy's opinion. We enjoy seeing if his experience is equal to ours. I sure hope you are able to make you dream come true in your retirement years. We haven't been to Amato's but we have been to several of the other places that Guy went to in Omaha, including my current fav place for a burger, Brewburgers. They make a bacon cheeseburger with the cheese and bacon on the inside of the burger and they have great onion rings. Plus one of my fav beers that's hard to find. Can't beat all of that! I'm loving that dream of yours. I have a long list of dreams I intend to achieve once my kids go to college (yeah right, we'll see about that! I'll be poor). There is one of Guy's features in Lafayette, IN that we frequent at least twice while we are up there. I'm kicking myself for not taking pictures and featuring it here. Boo me. Great dream!! I love Guy, he's great! I love experimenting with new dishes; unfortunately, my husband and middle child are not as adventurous as me 🙁 If it has too much green or an ingredient they don't recognize, both will turn their noses up. LOL @ "…family style, comfort food junkie."